Thomas J. Todaro, Sr., 65, of Forks Township, died Thursday, Dec. 18, 2003 in Easton Hospital. Personal: He and his wife, the former, Joanne West, celebrated their 38th wedding anniversary on April 23. 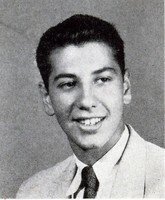 Thomas was a 1956 graduate of Easton High School. He had served in the Army. Mr. Todaro retired many years ago as an agent for Metropolitan Life Insurance Co. in Easton. Memberships: He was a life Member of the Weston Club in Easton. Survivors: his wife; his parents; a son Thomas J. Jr. of Forks ‘Township; a daughter, Joanne L. Corpora and her husband, John D, of Nazareth; two brothers, John of Palmer Township and Joseph of Bethlehem Township, Pa.; a sister, Teresa Fretz of Palmer Township; and a granddaughter, Olivia Rose Corpora. He and his wife, the former, Joanne West, celebrated tyeir 38th wedding anniversary on April 23. .
A daughter, Karen E. Sonntag, died in 2000. Services: Call from 10 to 11:30 a.m. Monday, in the Strunk Funer- al Home, Inc., 2101 Northampton St., Wilsori’Borough. Services and interment will be private and at the convenience of the family. Memorials: In lieu of flowers, donations may be sent to Olivia Rose Corpora for her college education, 643 Kathleen Drive, Nazareth, PA 18064.